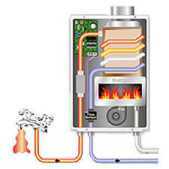 The central component of an instant hot water heater is a device called the heat exchanger. It's the chamber in which cold water, directly from the plumbing pipes, is heated virtually instantly and on demand. When warm or hot water is desired for a shower or from a kitchen faucet, a flow sensor indicates the incoming water supply and activates a computer within the tankless unit. The computer in the tankless hot water heater then calculates the difference between the incoming cold water and the desired hot water temperature. Depending on this calculation, a specific amount of natural gas, propane or electricity is then supplied to a gas burner or an electric coil. This gas burner (in natural gas and propane models) or electric coil (in electric models) transfers heat to the heat exchanger. The heat exchanger, being the heart and soul of any tankless hot water heater, then almost immediately heats up the incoming cold water that travels through the copper pipes that are wrapped around the heat exchanger. As soon as the shower is over, or the hot water tap is closed, the overwhelming majority of the natural gas, propane or electricity flow to the tankless hot water heater stop as well. The result is not just instant warm and hot water but also lower overall overall operating costs. With this flash heat and technology an instant water heater eliminates the unnecessary costs of reheating stored water for later use. This technology is how tankless units work and it's what makes these energy efficient water heaters worth considering.